Mixed-effects models are being used ever more frequently in the analysis of experimental data. However, in the lme4 package in R the standards for evaluating significance of fixed effects in these models (i.e., obtaining p-values) are somewhat vague. There are good reasons for this, but as researchers who are using these models are required in many cases to report p-values, some method for evaluating the significance of the model output is needed. 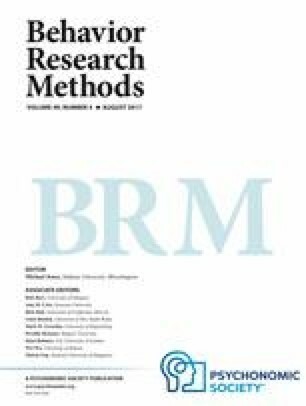 This paper reports the results of simulations showing that the two most common methods for evaluating significance, using likelihood ratio tests and applying the z distribution to the Wald t values from the model output (t-as-z), are somewhat anti-conservative, especially for smaller sample sizes. Other methods for evaluating significance, including parametric bootstrapping and the Kenward-Roger and Satterthwaite approximations for degrees of freedom, were also evaluated. The results of these simulations suggest that Type 1 error rates are closest to .05 when models are fitted using REML and p-values are derived using the Kenward-Roger or Satterthwaite approximations, as these approximations both produced acceptable Type 1 error rates even for smaller samples. Mixed-effects models have become increasingly popular for the analysis of experimental data. Baayen, Davidson, and Bates (2008) provided an introduction to this method of analysis using the lme4 package (Bates, Mächler, Bolker, & Walker, 2015b) in R (R Core Team, 2015) that has been cited more than 1,700 times as of this writing according to Web of Science. Many researchers who attempt to transition to the use of mixed models from other analysis methods such as ANOVAs find aspects of mixed modeling to be non-intuitive, but the one issue that has perhaps generated the most confusion is how to evaluate the significance of the fixed effects in the model output. This is because in lme4 the output of linear mixed models provides t-values but no p-values. The primary motivation for this omission is that in linear mixed models it is not at all obvious what the appropriate denominator degrees of freedom to use are, except perhaps for some simple designs and nicely balanced data. With crossed designs or unbalanced data sets, Baayen et al. (2008) describe the inherent uncertainty associated with counting parameters in a model that has more than one level. They point out that for such a model, it is unclear whether the number of observations (level 1) or the number of subjects and/or items (level 2) or the number of grouping factors (i.e., the number of random effects), or some combination of these, would define the denominator degrees of freedom. Although the logic behind the omission of p-values in the R output is clear, this omission presents a problem for researchers who are accustomed to use p-values in hypothesis testing and who are required by journals and by style standards to report p-values. Baayen et al. (2008) presented an elegant solution to this problem: p-values can be estimated by using Markov-chain Monte Carlo (MCMC) sampling. This technique repeatedly samples from the posterior distribution of the model parameters. These samples can then be used to evaluate the probability that a given parameter is different from 0, with no degrees of freedom required. However, this method has significant downsides. It cannot be used when random slopes are included in the model (or, more precisely, it was never implemented for situations when the model included random correlation parameters). This is especially a concern given that improperly fitted models lacking these random slopes can have catastrophically high Type 1 error rates, so that some authors recommend that all models should be “maximal,” with all possible random slopes included (Barr, Levy, Scheepers, & Tily, 2013). Given this, it is usually not feasible to employ MCMC sampling to obtain p-values. For this and other reasons, MCMC sampling is no longer an option in the current version of the lme4 package in R (Bates et al., 2015b). There are two other methods commonly used for evaluating significance of fixed effects in mixed-effects models. The first is the likelihood ratio test (LRT). LRTs compare two different models to determine if one is a better fit to the data than the other. LRTs are commonly used to decide if a particular parameter should be included in a mixed model. LRTs are most commonly used to decide if a particular random effect (say, a random slope) should be retained in the model by evaluating whether that effect improves the fit of the model, with all other model parameters held constant. Under the right circumstances, LRTs can be used to evaluate the significance of a particular fixed effect using the same logic. This approach shares with MCMC sampling the advantage that the user does not need to make any specific assumptions about model degrees of freedom (or rather, the user does not need to specify the model degrees of freedom). Further, LRTs can be used even when the model has a complex random effects structure that includes random slopes. When used for evaluating the significance of fixed effects, LRTs have one potential disadvantage: Using LRTs to compare two models that differ in their fixed effects structure may not always be appropriate (Pinheiro & Bates, 2000). When mixed-effects models are fitted using restricted maximum likelihood (REML, the default in lme4), there is a term in the REML criterion that changes when the fixed-effects structure changes, making a comparison of models differing in their fixed effects structure meaningless. Thus, if LRTs are to be used to evaluate significance, models must be fitted using maximum likelihood (ML). Pinheiro and Bates (2000) note that although likelihood ratio tests can be used to evaluate the significance of fixed effects in models fitted with ML, such tests have the potential to be quite anti-conservative. Barr et al. (2013) use this test repeatedly in their simulations, and suggest that for the numbers of subjects and items typical of cognitive research these likelihood ratio tests are not particularly anti-conservative. Even so, LRTs may be anti-conservative, especially for smaller data sets. The second most commonly used method for the evaluation of significance in mixed-effects models is to simply use the z distribution to obtain p-values from the Wald t-values provided by the lme4 model output. The logic behind this t-as-z approach is that the t distribution begins to approximate the z distribution as degrees of freedom increase, and at infinite degrees of freedom they are identical. Given that most data sets analyzed using mixed models contain at minimum many hundreds of data points, simply testing the Wald t-values provided in the model output as though they were z-distributed to generate p-values is intuitively appealing. While this method is often employed directly to generate p-values, it is also used implicitly by many authors who refrain from presenting p-values but note that t-values greater than 1.96 can be considered significant. There are no formalized guidelines for deciding if one’s data set is large enough to justify the t-as-z approach. Because this assumption has not been carefully evaluated, this technique could potentially be anti-conservative as well. The present paper reports a series of simulations. The first set was conducted in order to estimate the rate of Type 1 errors that arise when applying the t-as-z approach, and to compare those rates to Type 1 error rates from LRTs. These simulations were designed to (1) explore whether the two commonly-used techniques for evaluating significance are anti-conservative and (2) evaluate which method is preferable. A second set of simulations was conducted to investigate some newer methods for evaluating significance. These methods include the Kenward-Roger and Satterthwaite approximations for degrees of freedom, and parametric bootstrapping. These simulations were designed to (1) compare these newer approaches to the t-as-z approach and LRTs and (2) evaluate which method is preferable, being least anti-conservative and least sensitive to sample size. All simulations were run using the simgen package (Barr et al., 2013) in R to fit models to simulated data, varying number of subjects and items systematically. R Code and results of all simulations are available on the Open Science Framework (osf.io/fnuv4). For each simulation, 100,000 data sets were generated from a set of population parameters using simgen, as described in Barr et al. (2013; see online appendix for code). Each simulated experiment was designed so that the data set included a continuous response variable and a single within-items and within-subjects two-level predictor. For the purpose of these simulations, the size of the fixed effect was set to zero, so that any statistically significant effects would represent Type 1 error. These simulations used the default population parameters in simgen: β0 ~ U1(−3, 3), β1 0, τ00 2 ~ U(0, 3), τ11 2 ~ U(0, 3), ρS ~ U(−.8, .8), ω00 2 ~ U(0, 3), ω11 2 ~ U(0, 3), ρI ~ U(−.8, .8), σ2 ~ U(0, 3), pmissing ~ U(.00, .05); for more information on these parameters see Barr et al. (2013; Table 2) or the documentation for the simgen package. From each of these simulations, one or, if necessary, two slopes were dropped from the models if the full model failed to converge (1 % of cases). Type 1 error was then computed by using the t-values provided by the models to compute p-values from the z distribution, and then the proportion of models that was significant at the 0.05 level was calculated. For the ML models, a similar procedure was followed to calculate Type 1 error for the LRT output as well. The Type 1 error rates for all simulations are shown in Fig. 1. It should be apparent from Fig. 1 that all methods of evaluating significance were somewhat anti-conservative, yielding Type 1 error rates as high as 0.08, and never at or below the 0.05 level (0.05 was never within the 95 % confidence interval for any of the simulations; see Fig. 1). For models fit with ML, the “t-as-z” method produced consistently higher error rates than the LRT method. This difference appears greatest for smaller numbers of subjects and items. Interestingly, when using the t-as-z approach, REML models produced a consistently lower Type 1 error rate than ML models. This difference appears larger for smaller sample sizes (number of subjects and/or items). This is not surprising, as REML is less sensitive to small sample sizes than ML (Pinheiro & Bates, 2000). Because the “t-as-z” was better for REML-fitted models than for ML-fitted models, Type 1 error in these REML simulations were similar to those obtained using the LRT method for higher numbers (36+) of subjects and items. Also of interest is the fact that in these models, which had crossed random effects for subjects and items, Type 1 error rates vary as a function of the number of subjects and/or items in a way that was independent of the number of data points. Note that in Fig. 1 the error rates for the simulations with 12 subjects (left-most panel) are approximately equal for all numbers of items. Note further that the error rate for the 24-subject and 24-item simulations was lower than that for the 12-subject and 48-item simulations, even though the total number of data points was the same in each case (24 * 24 = 576 = 12 * 48). This suggests that Type 1 error rates are influenced by the number of second-level groups in the mixed model, and not solely determined by the number of data points (level 1 in the model). The results of these simulations show that p-values calculated for linear mixed models using either of the most frequently-used methods (LRTs, t-as-z) are somewhat anti-conservative. Further, these p-values appear to be more anti-conservative for smaller sample sizes, although the p-values obtained from LRTs appear to be less influenced by sample size. Type 1 error rates were sensitive to both number of subjects and number of items together, so that higher numbers of both were required for Type 1 error to approach acceptable levels. Further, LRTs generally had lower Type 1 error rates across all numbers of subjects and items, making this test preferable to the t-as-z method. A number of other methods for obtaining p-values are currently available. They include parametric bootstrapping and the Kenward-Roger and Satterthwaite approximations for degrees of freedom.3 Both the Kenward-Roger (Kenward & Roger, 1997) and Satterthwaite (1941) approaches are used to estimate denominator degrees of freedom for F statistics or degrees of freedom for t statistics. SAS PROC MIXED uses the Satterthwaite approximation (SAS Institute, 2008). While the Satterthwaite approximation can be applied to ML or REML models, the Kenward-Roger approximation is applied to REML models only. The significance of LRTs are typically evaluated using a χ2 distribution, but parametric bootstrapping is an alternate method for obtaining p-values from LRTs, in which these values are estimated by using repeated sampling. Thus, parametric bootstrapping does not make any explicit assumptions about degrees of freedom. As both LRTs and the t-as-z method are somewhat anti-conservative, one or more of these methods might prove to be preferable. The Kenward-Roger approximation, for example, appears to provide good results when applied to generalized linear mixed models (GLMMs; Stroup, 2015). To investigate this, more simulations were conducted. The Kenward-Roger and Satterthwaite approximations were tested together, and parametric bootstrapping was tested separately. All simulations also included the LRT and t-as-z methods for evaluating significance. Because a primary goal of these sets of simulations was to explore Type 1 error for smaller sample sizes, simulations were performed for combinations of two different numbers of subjects (12, 24) and three numbers of items (12, 36, 60). To see how the different methods compared for higher numbers of subjects and items, simulations with 36 subjects and 60 items were also conducted, for a total of seven different possible subject/item combinations. The Kenward-Roger and Satterthwaite approximations were implemented using the anova function from package lmerTest (Kuznetsova, Brockhoff, & Christensen, 2014). This function makes use of functions from the pbkrtest package (Halekoh & Højsgaard, 2014) to implement the Kenward-Roger approximation. For each of these simulations using the lmerTest package, 10,000 data sets were generated from a set of population parameters using simgen, in the manner described above. This number was chosen to make the simulations computationally feasible; as noted above, the alternate methods assessed here are significantly more computationally intensive. Type 1 error was also calculated using LRTs (for ML-fitted models only) and the t-as-z method (for both ML- and REML-fitted models). For the lmerTest simulations, these new error rates were highly similar to those obtained in the larger simulations reported previously, differing by an average of 0.0013. Type 1 error was calculated for p-values obtained using the Kenward-Roger (REML-fitted models only) and Satterthwaite (for both ML- and REML-fitted models) approximations for degrees of freedom. The Type 1 error rates from these simulations are shown in Fig. 2. For smaller numbers of subjects (12 and 24), both LRTs and the t-as-z approach were still somewhat anti-conservative, with LRTs being less anti-conservative. The Satterthwaite approximation applied to ML-fitted models was still slightly anti-conservative, although it performed better for larger sample sizes. The Satterthwaite approximation applied to REML-fitted models and the Kenward-Roger approximation (REML by default) produced highly comparable error rates, and were not noticeably anti-conservative (0.05 was consistently within the confidence intervals for these methods). Further, these last two approaches were the most robust for smaller sample sizes, producing similar Type 1 error rates for the 12- and 24-subject simulations (see Fig. 2). For higher numbers of subjects and items (36 and 60, respectively), all methods except for ML t-as-z appeared to produce acceptable levels of Type 1 error. Parametric bootstrapping was implemented using the mixed function from R package afex (Singmann, Bolker, & Westfall, 2015). This function makes use of functions from the pbkrtest package (Halekoh & Højsgaard, 2014). Parametric bootstrapping is even more computationally intensive than the other methods tested above, so these simulations were conducted on only 1,000 data sets generated using simgen.Type 1 error was also calculated using LRTs (for ML-fitted models only) and the t-as-z method (for both ML- and REML-fitted models). For the afex simulations, these new error rates were similar to those obtained in the larger simulations reported previously, differing by an average of 0.0059. Due to the smaller number of data sets, the simulation results for parametric bootstrapping are more variable than those for the other simulations (note the wider error bars). Even so, it is apparent from Fig. 3 that parametric bootstrapping produced lower Type 1 error rates than LRTs and the t-as-z approach for all combinations of subjects and items when applied to the same data sets. Indeed, Type 1 error rates for parametric bootstrapping were on average 0.0076 lower than those for LRTs from the same simulations. This is greater than the average improvement of 0.0029 for the Satterthwaite approximation (ML models) over LRT shown in Fig. 2 and similar to the improvement observed in Fig. 2 for the Kenward-Roger approximation (0.0085 lower than LRT Type 1 error rates) and the Satterthwaite approximation (REML models; 0.0083 lower than LRT Type 1 error rates). Figure 3 thus suggests that parametric bootstrapping can produce acceptable error rates for all numbers of subjects/items. At the same time, parametric bootstrapping does appear to be somewhat sensitive to sample size, with higher error rates for smaller samples. Several methods for evaluating significance were assessed to see if they might be preferable to LRTs. The Satterthwaite approximation for degrees of freedom, when applied to ML-fitted models, produced Type 1 error rates that, while somewhat better than LRTs, were still anti-conservative at least some of the time. However, when applied to REML-fitted models the p-values produced by the Satterthwaite approximation were not appreciably anti-conservative and were not as sensitive to sample size as the other methods. Likewise, the Kenward-Roger approximation, which requires REML models, produced acceptable rates of Type 1 error, and was also not overly sensitive to sample size. Parametric bootstrapping, as implemented here using R package afex (Singmann et al., 2015), also produced smaller Type 1 error rates that were superior to those obtained from LRTs and that are also likely not anti-conservative in most cases, although parametric bootstrapping appeared to be more sensitive to sample size than the other acceptable methods. The methods most commonly used to evaluate significance in linear mixed effects models in the lme4 package (Bates et al., 2015b) in R (R Core Team, 2015) are likelihood ratio tests (LRTs) and the t-as-z approach, where the z distribution is used to evaluate the statistical significance of the t-values provided in the model output. A series of simulations showed that both of these common methods for evaluating significance are somewhat anti-conservative, with the t-as-z approach being somewhat more so. Further, these approaches were also sensitive to sample size, with Type 1 error rates being higher for smaller samples. At higher numbers of subjects and items the Type 1 error rates were closer to optimal, although still slightly anti-conservative (see Fig. 1). This was true for both ML- and REML-fitted models. In Figs. 2 and 3, LRTs and the t-as-z approach for REML models appear to approach acceptable levels of Type 1 error, but the simulations represented in these Figures included fewer iterations, and so the confidence intervals were wider. Given that these common methods tend to be anti-conservative, and given that other, less anti-conservative methods of evaluating significance are readily available in R, it is recommended that users be cautious in employing either of these common methods for evaluating the significance of fixed effects, especially when numbers of subjects or items are small (<40–50). It is important to note that Type 1 error was sensitive to both the number of subjects and the number of items, so that one cannot “make up for” a small number of participants by having many items, or vice versa. Some users replace the t-as-z approach with a rule of thumb that a t greater than 2 is to be considered significant, in the hopes that adopting this stricter threshold will avoid the anti-conservative bias of the t-as-z approach. Using the results of the first simulation set to explore this t-is-2 approach reveals Type 1 error rates that are similar to LRTs, being slightly larger for smaller numbers of subjects/items and slightly smaller for larger numbers (the actual values depend on whether the model was fitted with ML or REML). Thus, while the t-is-2 method appears preferable to the t-as-z approach and may be used as a rule of thumb, it is still sensitive to sample size, being somewhat anti-conservative for smaller sample sizes. Other methods of obtaining p-values in R were also tested, including the Satterthwaite and Kenward-Roger approximations for degrees of freedom as well as parametric bootstrapping. When applied to ML models, the Satterthwaite approximation was better than LRTs but still somewhat anti-conservative. Parametric bootstrapping was also preferable to LRTs and appeared capable of producing acceptable Type 1 error rates, although it seems that parametric bootstrapping is still sensitive to sample size in the way that LRTs are, so that for smaller samples parametric bootstrapping might still be anti-conservative. The Satterthwaite and Kenward-Roger approximations produced highly comparable Type 1 error rates, at least when the Satterthwaite approximation was applied to REML models. Neither of these methods appeared to be noticeably anti-conservative. Importantly, these methods produced similar Type 1 error rates across different sample sizes, while error rates for all other methods tended to increase as sample size decreased. Thus, these two methods may be preferred when evaluating significance in mixed-effects models, especially when the number of subjects and/or items is smaller. Both lmerTest (Kuznetsova et al., 2014) and afex (Singmann et al., 2015) have an anova function which can be used to provide p-values for each factor, calculated from the F statistic. The afex function implements the Kenward-Roger approximation, while lmerTest can be used to implement either approximation. Both functions call the KRmodcomp function from the pbkrtest package for the Kenward-Roger approximation (Halekoh & Højsgaard, 2014), but are somewhat simpler to use than this function. Like LRTs, these tests provide one p-value for each factor in the model, even if a given factor has more than one level. If the user desires parameter-specific p-values derived from the t-values in the lmer output, the lmerTest package can provide these through the summary function using either the Satterthwaite or Kenward-Roger approximation. Examples of the usage of these functions are provided in the Appendix. Several recommendations can be made based on the results of these simulations. First, any of the alternate methods tested here are preferable to LRTs and the t-as-z approach (and its variant, the t-as-2 approach). Second, although models fitted with maximum likelihood do not produce catastrophically high Type 1 error rates for smaller sample sizes, REML-fitted models still appear to be generally preferable for smaller samples. Note that the “small” samples in these simulations still contained a minimum of 144 data points. The advantage for REML models persisted for larger samples as well. This advantage for REML was most notable and consistent when identical evaluation methods (t-as-z, Satterthwaite) were used. While some methods for evaluating significance do not allow a choice between ML and REML (Kenward-Roger, parametric bootstrapping), when the selected method for obtaining p-values permits such a choice REML should be preferred. Third, the Kenward-Roger or Satterthwaite approximations (applied to REML models) produced the most consistent Type 1 error rates, being neither anti-conservative nor overly sensitive to sample size, and so these methods may be preferable for users who desire to avoid Type 1 error. Users who decide to adopt either the Kenward-Roger or Satterthwaite approximations should be aware of two potential issues. The first issue is that these recommendations are based on simulations using somewhat idealized data and simple, single-factor models, so the observed Type 1 error rates might not hold up for a model with a more complex covariance structure (see Schaalje, McBride, & Fellingham, 2002, who show that the Kenward-Roger approximation, while generally robust, can lead to inflated Type 1 error rates when complex covariance structures were combined with small sample sizes). The second is the issue of power. The focus of the present simulations was to identify methods that produce the most ideal Type 1 error, and so it is possible that using the Kenward-Roger or Satterthwaite approximations could be associated with a drop in statistical power. Given that psychology experiments are often underpowered (Westfall, Kenny, & Judd, 2014), even a small loss of power may be a concern. To see if there is any power loss associated with these methods, a set of small simulations (two different numbers of subjects (12, 24) and items (12, 24), each with 100 data sets) were conducted with the size of the fixed effect set to 0.8 (i.e., the null hypothesis was false). The power (defined as rate of rejection of the false null hypothesis) of all methods are shown in Table 1. The Kenward-Roger and Satterthwaite approximations (REML models) had slightly inferior power compared to other methods across simulations. However, these methods also had lower Type 1 error rates, so it is possible that this difference in power can be attributed to the error rate differences. To test this, corrected power (power’) was computed, as described by Barr et al. (2013); separate simulations were conducted, identical to those described earlier in the paragraph, but with the null hypothesis set to true. The p-value at the 5 % quantile was computed for each of these new simulations and this p-value was used instead of 0.05 to compute power’. This method should provide an estimate of differences in power, controlling for Type 1 error rate. As Table 1 shows, corrected power was highly similar for all methods, suggesting that any differences observed in uncorrected power can be attributed to differences in Type 1 error rates and that using the Kenward-Roger and Satterthwaite approximations should not result in a noticeable loss of power. Of course, these simulations are small, so caution in necessary when interpreting these results. In sum, the results of these simulations suggest that Type 1 error rates are most optimal across different sample sizes when models are fitted using REML and p-values are derived using the Kenward-Roger or Satterthwaite approximations. Although these approximations appear to produce good results, it is important to note that the present simulations should not be interpreted as establishing what the appropriate degrees of freedom actually are for linear mixed-effects models. Instead, these simulations serve to further underscore the complexity of the question, as Type 1 error rates for the various tests (although quite low overall) were not predictable from either the number of data points (level 1) or the number of grouping factors (level 2). Indeed, methods that assume or approximate degrees of freedom in order to derive p-values for the output of lmer models are “at best ad hoc solutions” (Bates, Mächler, Bolker, & Walker, 2015a, p. 35). Furthermore, these simulations make it clear that results should be interpreted with caution, regardless of the method adopted for obtaining p-values. As noted in the introduction, there are good reasons that p-values are not included by default in lme4, and the user is encouraged to make decisions based on an informed judgment of the parameter estimates and their standard errors, and not to rely wholly or blindly on p-values, no matter how they were obtained. ~ U(min, max) means the parameter was sampled from a uniform distribution with range [min, max]. An identical set of simulations was conducted with backwards-fitted (non-maximal) models. The results of these simulations were highly similar to those reported here, in that Type 1 error rates were consistently inflated, especially for lower numbers of subjects and items, and that LRTs consistently had lower Type 1 error rates than the t-as-z approach. These are the primary methods available for obtaining p-values. See the documentation for the lme4 package (Bates et al., 2015b) for options for obtaining confidence intervals. ###R Code for implementing the recommended methods for obtaining p-values in lme4. ##Using R Package lmerTest to implement Satterthwaite or Kenward-Roger approximations. Model.ML.afex.LRT #Returns results of Likelihood Ration Test on Fixed Effect. #Note 1: This code assumes that you are attempting to obtain p-values after having settled on a final random #effects structure. Models shown here are maximal, with all possible random slopes/intercepts.